In many places, travellers will experience an unspoiled medieval feel while the major cities are vibrant with a newfound buzz. The landscapes are breathtaking with jagged alpine peaks, isolated rural communities, vineyards and orchards. This fascinating journey to the heart of the Caucasus offers a surprising taste of old world Eastern European charm. Bridging East and West, these former Soviet Republics are hot on the discerning traveller’s radar and offer widespread appeal. It is little known that Armenia was one of the first countries to adopt Christianity and, so there are magnificent Orthodox churches in abundance in the most unexpected locations. Neighbouring Georgia lays claim to the world’s oldest wine industry and on this journey rare skin-fermented wines stored underground in clay jars are uncorked and savoured. Both countries boast thousands of years of history and a rich cultural heritage of music, art, poetry and dance. The food is delicious and hearty and reflects the region’s influences from Eastern Europe, the Mediterreanean and the Middle East. In many places, travellers will experience an unspoiled medieval feel while the major cities are vibrant with a newfound buzz. The landscapes are breathtaking with jagged alpine peaks, isolated rural communities, vineyards and orchards and above all incredibly hospitable people. Arrive into the Georgian capital and transfer privately to your hotel. This evening join your tour director and fellow travellers for a cocktail briefing on the adventure ahead. A city dominated in turn by traders, warriors, tyrants and dictators, Tbilisi is a blend of cultures where myth and history meet, where different cultures collide on street corners and where different faiths happily co-exist. Our adventure starts with a walk through the cobbled streets of the atmospheric old town – a chance to breathe in the living past. Visit the 12th century Metekhi Church and a 19th century Jewish synagogue. Admire the old Georgian houses with their distinctive wooden, curved balconies and the Sioni Cathedral. You’ll see the oldest surviving church in Tbilisi, the Anchiskhati Basilica, before getting a bird’s-eye view of the city from the Narikala Fortress which can be accessed by cable car, or on foot for those feeling more energetic. On the way back down, stop at the Sulphur Baths and the National Museum of Fine Arts. Tonight is a chance to savour some of Georgia’s finest cuisine at a favourite traditional restaurant. 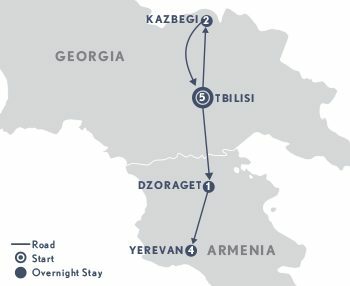 Today we will explore the most picturesque and fertile part of Georgia - Kakheti, which borders the Great Caucasus range. This region of verdant valleys and protective mountain slopes is the birthplace of viticulture and winemaking with archaeological evidence showing over 8,000 years of production. Admire the profusion of vineyards and beautiful churches as you drive through. A stop is made at the 9th century Bodbe Nunnery, where St. Nino, the 4th century female evangelist is buried, before arriving at the pretty fortified town of Sighnaghi, famous for its wine and carpet making. Meander through the narrow streets in the shadow of the town’s distinctive wooden balconies richly decorated with ornamental carvings. Views of the surrounding Kizikhi area are breathtaking. A unique cultural interaction in store today when you lunch with a local family serving up traditional dishes from the region, and of course local wines. Before returning to Tbilisi we visit the grand Tsinandali estate, with its opulent palace and grounds, once home to the noble Chavchavadze family and noted for its historic winery. Another day uncovering the attractions of Tbilisi starting at the Simon Janashia Museum of Georgia which houses an extraordinary collection of gold filigree work dating from the 6th century BC and items of repoussé work and jewellery. Continue to the Georgian National Centre of manuscripts for a visit with a specialist to talk about the important restoration work being done there. After lunch we visit a local workshop, where artisans introduce us to the ancient technique of cloisonné, a decorative enamelwork tradition over 1,200 years old. Finish the day at the Sukhoi Bridge market where you’ll find all sorts of mementos from jewellery and artwork to tractor parts, crystal chandeliers and military medals. The living museum and World Heritage site of Mtskheta is our first stop today. Georgia’s cultural and religious centre, it is also one of the country’s oldest towns. Located at the confluence of the Aragvi and Mtkvari rivers Mtskheta was at the crossroads of many trade routes and is full of fascinating architectural and historic monuments. We visit the striking Jvari Church, a masterpiece of the early medieval period. Next stop, Svetitskhoveli Cathedral, said to be the burial place of Christ’s robe. Heading along the Georgian Military Highway, we visit Ananuri Architectural complex, former residence of the Dukes of Aragvi with churches and towers dating back to the 16th and 17th centuries overlooking Jinvali reservoir. We’ll arrive into the sleepy town of Kazbegi later this afternoon where views of Mt. Kazbek, seventh highest peak in the Caucasus Mountains, are breathtaking – especially from your hotel room. This morning we head for the 14th century Gergeti Holy Trinity Church which perches high on a hill overlooking the town and the surrounding mountain scenery. This is surely one of the world’s most beautiful sights and you can get up close by 4WD, or for the more energetic, on foot. More traditional Georgian cuisine and hospitality to enjoy today over lunch with one of the local families. This afternoon is at leisure to enjoy the stylish Nordic atmosphere of the hotel before sundowners this evening on the terrace. Today’s adventure takes us to the fertile Kartli province, in the heart of the country with a stop in Gori the birthplace of Joseph Stalin where the controversial Stalin museum traces his life from humble beginnings to the end. Lunch today is in the atmospheric old brick cellars of Château Mukhrani where a vineyard was first established in the late 19th century. Pair traditional dishes with the local wine. We farewell Georgia this morning crossing into Armenia at the Sadakhlo border. Less than an hour south we stop at the Haghpat and Sanahin monastic complexes which are representative of Armenia’s finest religious architectural tradition with a unique style blending elements of Byzantine ecclesiastical architecture and the traditional vernacular of the Caucasian region. Our medieval style hotel is located in a remote location beside the Debed River on the main road from Tbilisi to Yerevan, mid-way between the two capitals. A traditional dinner of Armenian cuisine is arranged this evening. Travelling further south today we stop at the spa town of Dilijan, with its beautiful mountain scenery and unique architecture to visit the 10th-13th century Haghartsin Monastery which is tucked away in a verdant valley to the northeast. The complex comprises churches, vestibules, the burial vaults of two kings of the Kyurikian dynasty and a refectory. Afterwards head to Lake Sevan, the largest body of water in Armenia and the Caucasus region, where a boat trip is included before continuing on to the Armenian capital. Yerevan stretches along the banks of the River Hrazdan, under the wistful gaze of biblical Mt. Ararat and guarded by the tremendous statue of Mother Armenia at Victory Park. Our introduction to the capital begins with a guided tour of the city which was founded in 782 BC, making it one of the world’s oldest continuously inhabited metropolises. See the beautiful Government buildings, the Central Post Office and banks and visit the State History Museum as well as the Cafesjian Modern Art Museum which exhibits collections of Armenian and international contemporary artworks. Discover why Armenian brandy is world famous at a VIP tasting specially organised for us at the Yerevan brandy factory. There is also time this afternoon to pore over the myriad stalls at the Vernissage flea market, a short walk from the hotel. Best buys include wooden carvings, traditional carpets, old coins, books, jewellery and musical instruments. A biblical focus this morning on a visit to Etchmiadzin Cathedral for holy mass. This ancient cathedral is headquarters for the Armenian Orthodox church and is believed to be the oldest Christian establishment initiated by a state in the world. Relics in the church collection include one of the lances said to have pierced the side of Christ and wood from Noah’s Ark. Later we take in the nearby ruins of the famous 7th century Zvartnots Cathedral, a 49 metre high three-tiered pyramidal church embellished with beautiful carvings. During excavations, a large architectural complex with the entrance halls of the patriarch’s palace, a bath-house and other buildings to the south and west were found. Lunch today is at the family owned Megeryan Carpet Factory & Museum. Get comfortable as you admire the exquisite handmade carpets before a traditional Armenian lunch in the rustic, but atmospheric, restaurant. Our morning begins with a special, and spiritual, vocal performance in the acoustic hall of the ancient Geghard Monastery. Partly carved in a cave, Geghard represents another incredible architectural complex. Inscriptive and documentary references to the monastery, also known as Ayrivank, date from the 7th and 10th centuries, respectively. Afterwards, a visit to the pagan Temple of Garni, which dates to the Hellenistic era, built to honour the Sun God Mitra and a symbol of pre-Christian Armenia. Built around 77 A.D. as a summer residence for the then empress, it is said that Emperor Nero contributed to its construction. It is the only Greco-Roman colonnaded building in the country. Afterwards, we take part in a centuries-old Armenian cultural tradition at a hands-on lavash making ceremony. The dough is kneaded, rolled and baked in the wood-fired oven before being served for lunch with barbecued meats, spicy peppers and curds in a local home. Enjoy some time at leisure this afternoon before a farewell dinner. Last group event: Farewell dinner at 8.00 p.m on Day 12.